PennsylvAsia: "Instead of Disaster: Cinema After '311'" at Pitt, November 30. "Instead of Disaster: Cinema After '311'" at Pitt, November 30. 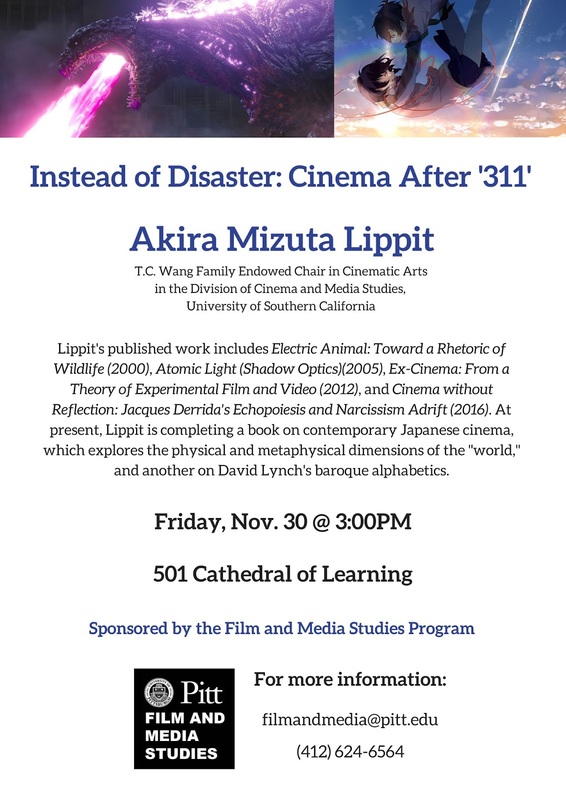 The University of Pittsburgh's Film and Media Studies Program will host Akira Mizuta Lippit and his talk "Instead of Disaster: Cinema After '311'" on November 30. Akira Mizuta Lippit is Vice Dean of Faculty in the University of Southern California School of Cinematic Arts, and the T.C. Wang Family Endowed Chair in Cinematic Arts in the Division of Cinema and Media Studies. He is also Professor of Comparative Literature and East Asian Languages and Cultures in the USC Dornsife College. His interests are in world cinemas, critical theory, Japanese film and culture, experimental film and video, and visual studies. Lippit’s published work reflects these areas and includes four books, Ex-Cinema: From a Theory of Experimental Film and Video (2012); Atomic Light (Shadow Optics)(2005); Electric Animal: Toward a Rhetoric of Wildlife (2000); and his most recent book, Cinema without Reflection: Jacques Derrida's Echopoiesis and Narcissism Adrift (2016). At present, Lippit is completing a book on contemporary Japanese cinema, which explores the physical and metaphysical dimensions of the "world," and another on David Lynch’s baroque alphabetics. The talk will start at 3:00 pm in 501 Cathedral of Learning (map) and is free and open to the public.